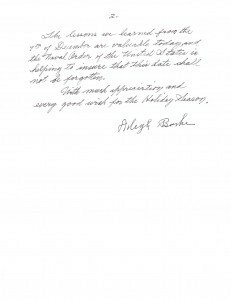 Admiral Arleigh Burke, who served an unprecedented three terms as Chief of Naval Operations, is renowned for his exploits during World War II in the Pacific. Yet his career during the war got off to an inauspicious debut. Then-Lieutenant Commander Burke was stationed at the Naval Gun Factory in Washington, DC in 1941. In an anecdote written about by NHF Director Dr. David A. Rosenberg in a chapter of the book “Men of War: Great Naval Leaders of World War II,” Burke spent the evening of 6 December 1941 discussing the potential vulnerability of the Pacific Fleet at Pearl Harbor with a former shipmate, Marine Major H. D. “Bucky” Harris. They talked of sending off a telegram to warn someone, but joked that no one would listen to a pair of “crazy drunken poops.” The following afternoon, as the United States scrambled to prepare for a war thrust upon them at precisely the point the two friends had speculated, Burke was busy working to increase production at the Gun Factory. He almost immediately requested orders for sea duty in the Pacific, but the request was denied. It was not until 1943 that Burke found himself on the way to the Pacific, and began to build his legend. 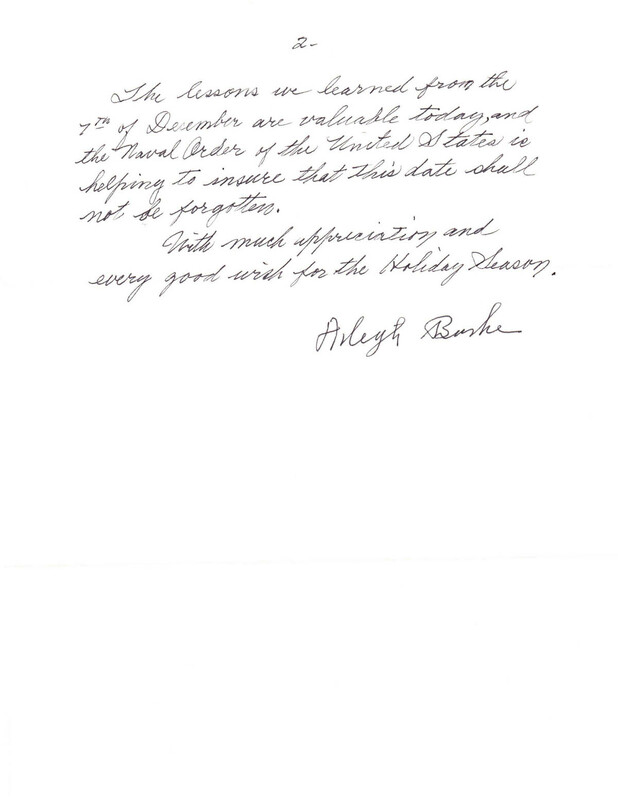 In 1988 the Naval Order of the United States invited Burke, then Honorary Commandery Commander, to attend their 1988 Pearl Harbor Remembrance Dinner. At the age of 87, and with failing eyesight, he was unable to attend. 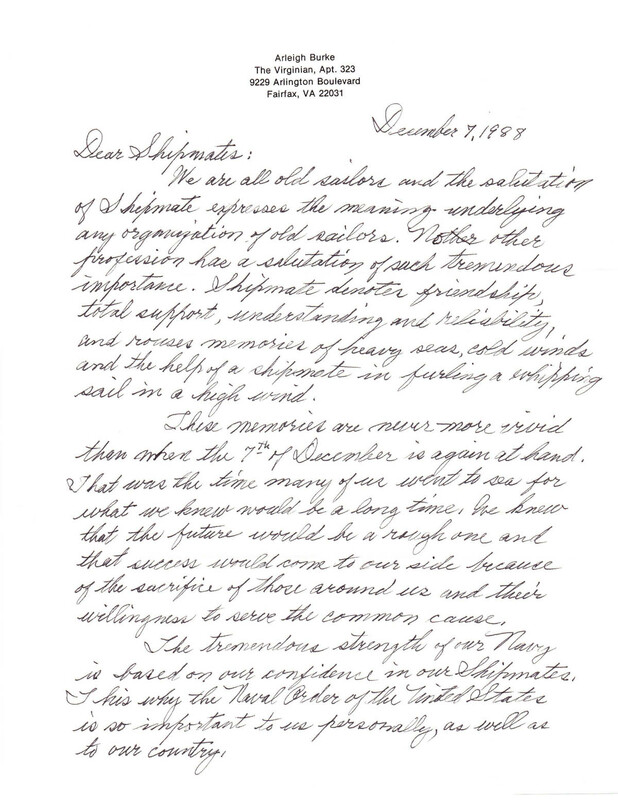 Instead, he sent the attached letter to Captain James Brooke, USN (Retired) to be read at the dinner. Reading it you will understand that it was received with enthusiastic admiration and appreciation. 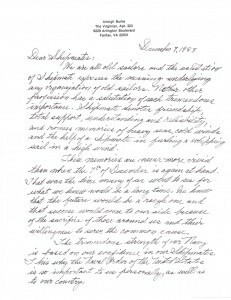 Click on either of the two letter pages below to read a full sized version.